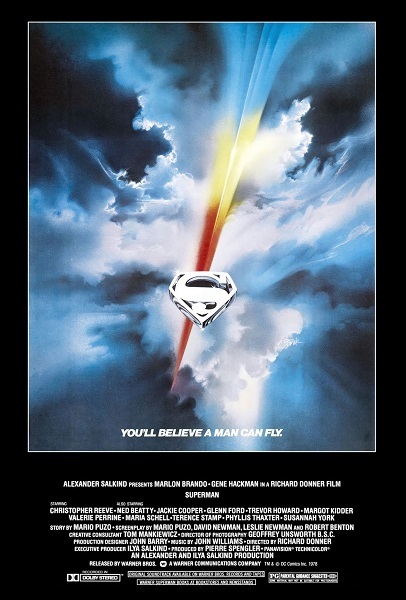 After nearly forty years, Ellie and Tim still believe a man can fly as they talk about the Man of Steel's first feature film outing, Superman: The Movie from 1978. We discuss the value of Superman as an symbol of optimism and decency in a cynical age, comment on the perceived religious metaphors in the Superman mythos, and Ellie describes her childhood encounter with the man himself, Christopher Reeve. Warning: Contains explicit language, spoilers, truth, justice, and the American way. Want to discuss your favorite cinematic Superman? Can you read our minds? Are you interested in purchasing some beachfront property on Lex Luthor's new west coast? Leave a comment and keep the discussion going. I've never been able to get into Superman like most others do. I love the first hour, but once everyone gets to Metropolis, I do find it to be pure screwball camp, absolutely on the level of West/Ward Batman. Very skillfully executed camp, and with a marvelous cast, I just don't find the nuance and weight that others see. It's silly. It's fun silly, but just silly. And I'm not among those in favor of the reversing time sequence, especially just from a narrative standpoint. And I say this as someone who's intro to Superman was the George Reeves series when it aired on Nick at Nite. Superman 2 is my absolute least favorite of the franchise, as not only does it continue the camp, but the switch in directors and a hasty re-rewrite leave it feeling rushed and sloppy. And I never got Terrance Stamp's Zod. Again, I don't see what others see. I find him as wooden and uninteresting as I find Stamp in most roles, and don't feel he in any way lived up to his intro in part 1. Ursa and Non are fantastic. Zod, no. Superman 3 is odd. It's not a good Superman film, nor is it even a good film at all, but it's just such an odd and captivating (to me at least) character study of Gus that I always get pulled into it. And even on the Superman front, it has interesting things going on like the battle with his evil self, or being drawn back to Smallville and the first woman he loved. Also, the gloriously terrifying Brainiac cyborg graft sequence. Superman 4... I'm charmed by. It's awful, and a visible trainwreck of a production, but whenever Nuclear Man is on screen, with that roar, that mane of hair, that outfit, I light up. I want way more Nuclear Man. I even outlined a Nuclear Man fanfic a while back which I should really dig out some day. Supergirl is also messy, but fun and charming. There's a sincerity to it which overcomes a lot of its flaws, and Helen Slater is great. Superman Returns has many great sequences, some excellent filmmaking, and at least half the casting is great, it just feels like they went in without a full script and are trying to find a story and themes as they go along. They never pull it together, but there's stretches of that movie I get sucked in by. I haven't listened to the Man of Steel bonus, so I'll save thoughts for there. Though in short, I don't hate Man of Steel, nor BvS. I don't love them, but I'm okay with them. Mostly. Ish. I do acknowledge that some of my affection for the series is colored by nostalgia and the fact that I grew up with it. I have some friends who have expressed a similar ambivalence toward the first film and some of the others. And I can't totally deny the camp aspects of it, though to me, it comes across as something of a feint, much as with the Lex Luthor character. Just as he seems goofy and silly, only to suddenly be revealed to be chillingly cold-blooded, the movie seems fun and campy only to hit you with that raw moment of Superman reacting to what happens to Lois and reminding you there are real stakes for everyone. The "turning back time" ending does introduce some problems as we have to ask why Superman can't just do that whenever his loved ones are at real risk or things don't go as planned. However, it's such a romantic concept in its ridiculousness, I can't help but appreciate it. As for the second film, watching it with older eyes, some of the flaws caused by the switch in directors definitely are more apparent, especially that overlong scene where Zod and company act like bullies in that random Midwestern town. That said, I think Zod has some of the same bait-and-switch qualities of Luthor. He's presented as something of a cartoon with some humor at his expense, and yet during the scene with E.G. Marshall as the President, where he sees through the commander-in-chief's trick, we see that Zod is sharper than we might have thought, suggesting this is a real adversary for Superman. The third film is a bizarre mess but it is still one I enjoy for many of the reasons you mentioned, though watching Richard Pryor in it makes me think we dodged a bullet when Paramount's plans to get Eddie Murphy in Star Trek IV failed. Sometimes an actor has such a unique presence he becomes almost a genre unto himself. And now I'm really curious as to what your Nuclear Man fanfic entailed.